Are you familiar with the goodness known as things on toast? The basic premise is to take good bread — which is, of course, already wonderful on its own — make it toasty and top it with things you love, like cheese and fresh produce and honey. If you take a moment and think on that, I’m not sure any further elaboration is necessary. But here I go, nonetheless. 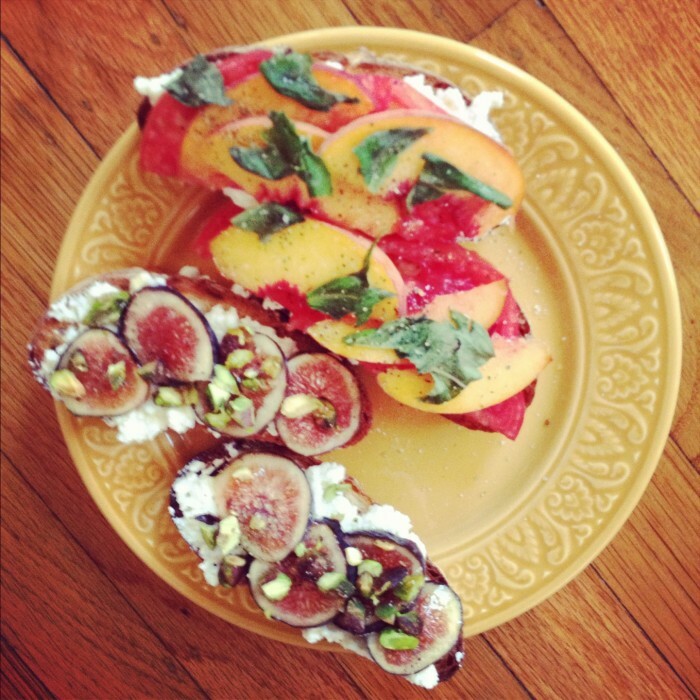 I ate bruschetta while growing up, first in restaurants and then at home. We would pile the bread with chopped tomatoes and fresh herbs and douse the whole thing with olive oil. Delicious! The taste of summer. But beyond this and classic breakfasts of peanut butter with jam, we went no further with our adornment of toast. It wasn’t until I was cooking on my own, for one, that I discovered the glory of putting other good things on good bread — in short, it is magic. I believe the first thing I really loved in this preparation was Molly Wizenberg‘s soft scrambled eggs and leeks on toast. It was probably her story that first compelled me, but I found, too, that it was precisely my kind of comfort food, luxury in the shape of a simple dinner. This discovery occurred when I was living alone, working my first full-time job out in the great big world and striving desperately to understand life. I don’t think it’s coincidental that the recipe comes from the time in her life when she, too, was single and trying to figure things out. Even though I was reading her words years later, she had been in my position, and she made it. Comfort, indeed. Next, I found the tomato sandwich. Despite my nearly lifelong aversion to mayonnaise, and my general indifference when it comes to sandwiches, I was finally compelled by my sister’s friend to give it a try. We were visiting him in Rhode Island, eating lunch next to the fields of the organic farm at which he worked. It may have been the soft green grass beneath us or the perfect crispness of the autumn day or the fact that we had just plucked the ripe, gorgeous heirloom tomatoes from where they drooped on their stems, but I was sold in an instant. It became a summer classic for me; I love it open faced, with the bread toasted, the mayo spread thinly, the tomatoes ripe and lots of salt and pepper atop. And when the juices collect and drip down to my wrists? Oh, that is bliss. At some point, I began topping toast with yogurt and jam. I really don’t know how that began, but it is a go-to snack these days, and the husband, once unsure of my peculiar practice, is now with me ALL THE WAY on this one as well, and likely surpassed my yogurt-and-jam-on-toast consumption long ago. Finally came the suggestion of ricotta. With tomatoes and basil! With fruit! With mint and honey! Ben and I tried this preparation for the first time over a year ago, I believe prompted by Deb at Smitten Kitchen. It was glorious. Light, flavorful and full of contrasting textures — crisp bread, soft cheese, slices of tomato yielding to the bite. All of this on plain old bread, jazzed up by an unassuming run through the toaster oven and a few extra ingredients tossed on top. The toppings are endless, the versatility proven. Alongside a pile of salad, or maybe just a very full glass of wine, this is the perfect dinner for the single girl. But it is just as fitting for two, with some olives and an interesting salad and a bottle of wine in the event of a date, or with nothing else at all on a lazy Sunday evening. And spread on a platter, or in its separate parts atop a cutting board for individual assembly, it will impress any dinner guest, if only because you can make it so pretty. Are you convinced? 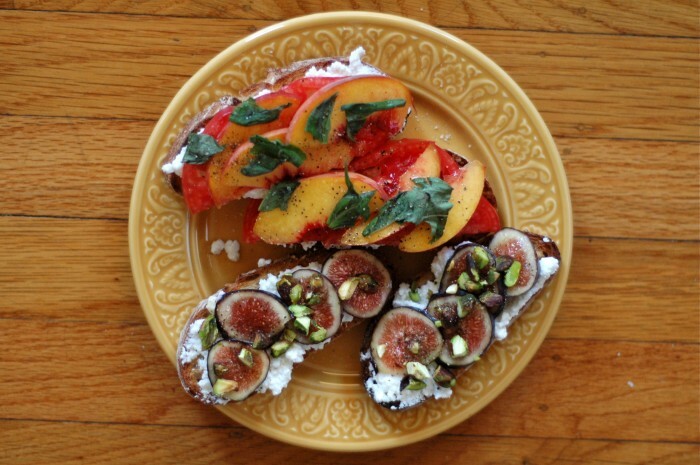 I hope so, because I have two proposals for crostini made with fleeting summer produce — figs, tomatoes, peaches, those abundant summer herbs. Perhaps you can’t chronicle the last several years of your life via crostini preparations (which, by the way, I didn’t realize I was doing until at least halfway through this post), but I’d love to hear: do you have a favorite topping for toasty bread? If you’re feeling particularly ambitious, you can make your own ricotta! This was a new endeavor for me, but I had been contemplating it for some time. In fact, it was one of my New Year’s resolutions, which I hope doesn’t seem too odd. In the past week, I’ve made two batches; it’s really not difficult at all. The peach and tomato combination may be foreign, but Joy convinced me to try it, and let me just say: the lady has it RIGHT. But if you’re a tomato purist, feel free to leave the peaches out — this is my preferred preparation of tomato-only crostini as well. And of course, these are only ideas! Feel free to substitute and tweak to taste. Slice the bread into slices 1/2-inch thick, or thinner. Toast in the toaster, under the broiler or on the grill. For the tomato and peach toasts, slice a clove of garlic in half and rub the cut surface on one side of the warm bread. Spoon ricotta on top. Layer with slices of tomato and slices of peach. Sprinkle generously with salt and pepper, and top with basil. Drizzle with olive oil and balsamic vinegar. 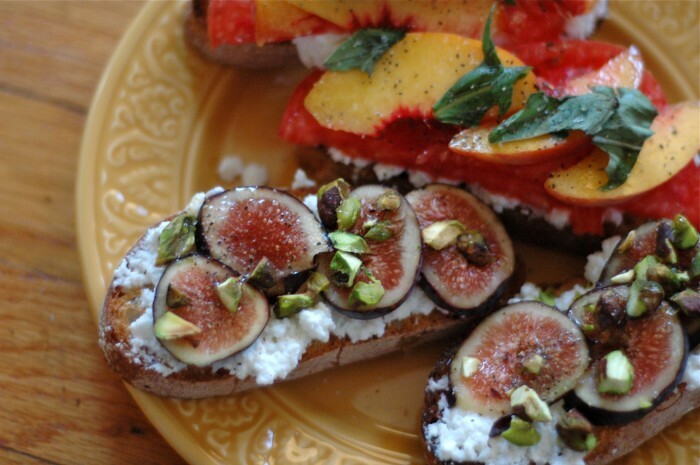 For the fig and pistachio toasts, spoon ricotta onto the toast. 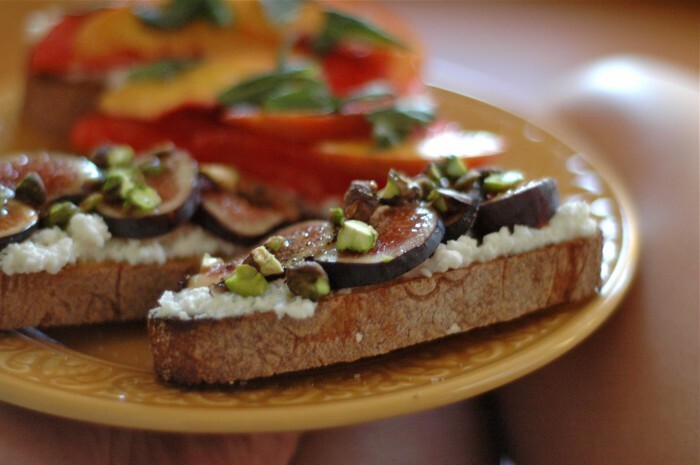 Layer with slices of fig. Sprinkle generously with chopped pistachios, salt and pepper. Top with mint. Drizzle with olive oil and honey. we’re going to have to go to bar tartine for brunch. you’ll see why! I think I’ll just go ahead and take credit for facilitating a happy marriage! I think that’s fair… We are indebted to you!! I will never, ever tire of Things on Toast. Nor will I! ;) Thanks, Kathryne.